After many years of engineering and progress in the way of modernizing the side-by-side, the 2016 Yamaha Wolverine R-Spec has rolled into town. 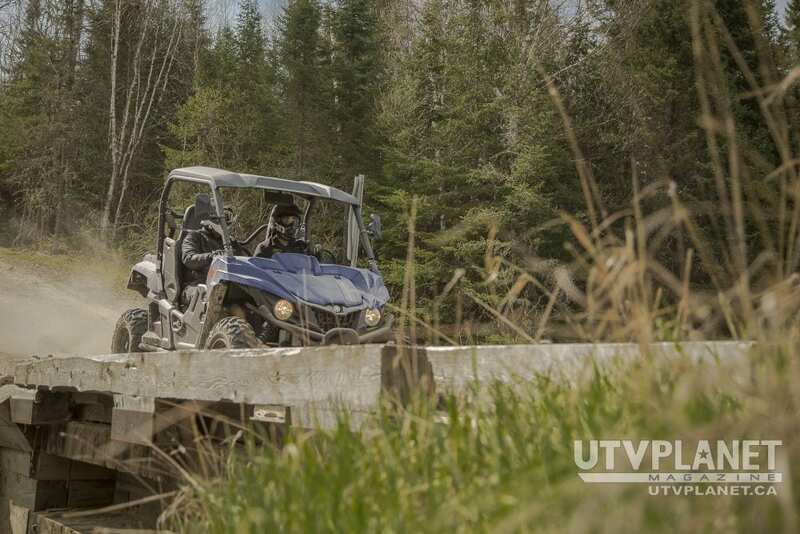 This 708cc dual overhead cam long travel suspended rig gives the explorers in the family a vehicle to find new trails. 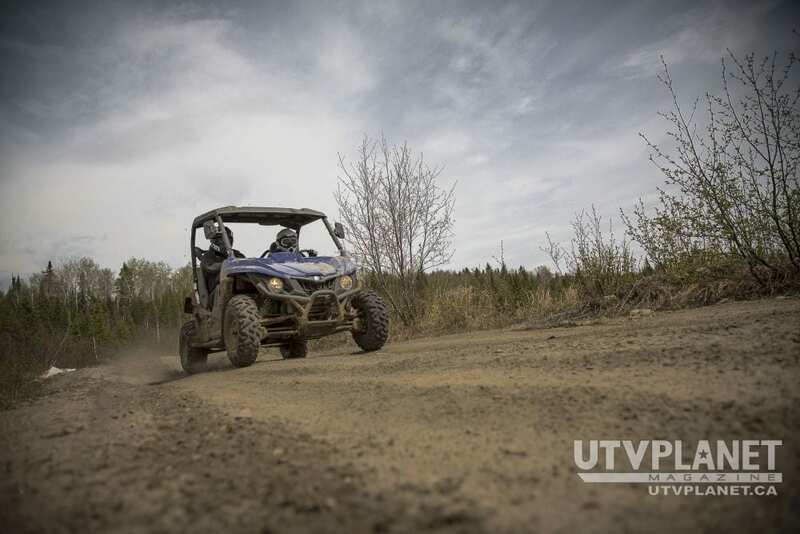 Our time in the seat and behind the wheel of the Wolverine R-Spec was short, but it did prove to us that Yamaha has been working on a ride that would not only get you over the rough trails, but give you the confidence to do it time and time again. With the mountains and trails calling us we headed into the hills. 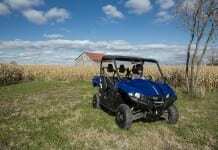 The Wolverine R-Spec is powered by a totally new 708cc dual overhead cam power plant. This fuel injected mill provided the excitement for the knarly climbs around our ride location and smooth linear power for subtle and gentle use on the slowest terrain. The liquid cooling of the Yamaha engine kept it performing all day like a champ even though our speeds were kept low. 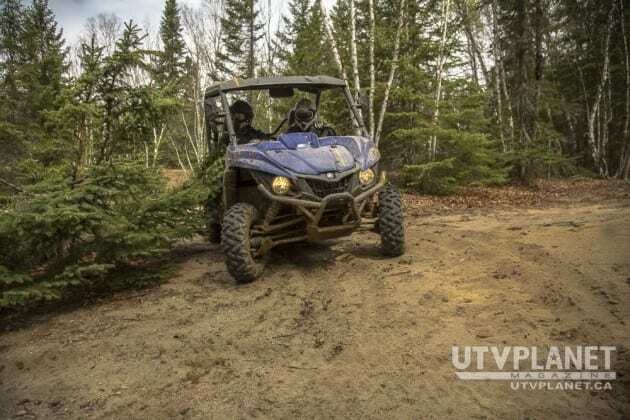 Yamaha’s mantra behind the Wolverine R-Spec would be that the trail adventurer and outdoor enthusiast would actually cruise and enjoy the ride into uncharted territory all while feeling confident in any terrain they should encounter. Dodging larger terrain obstacles like huge stone and deep ruts were of course on our minds, but the suspension of this new Wolverine R-Spec is made to help with those seemingly impossible obstacles. 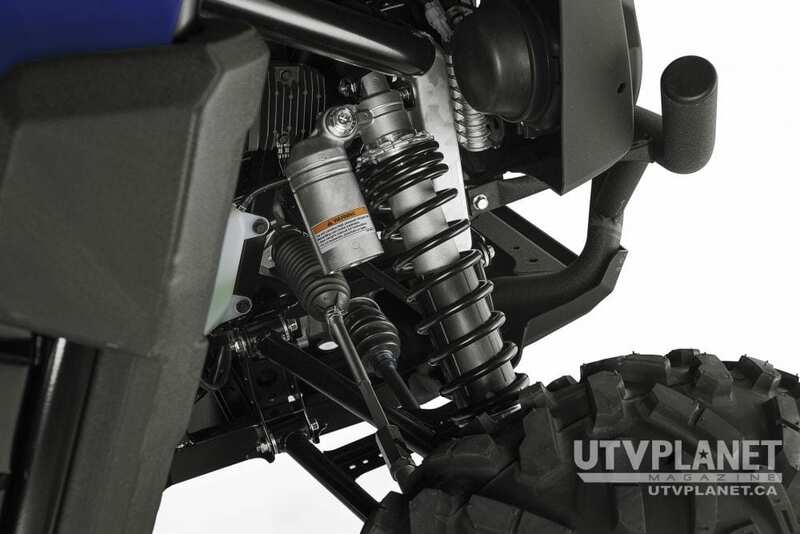 Long travel suspension on the front and rear of the Wolverine allows the wheels to move more than the average SXS suspension and with more drop out than industry competition. 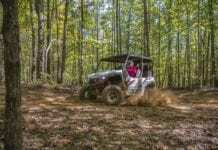 Drop out is when the control arms literally drop out or down to provide more contact to the trail for the machine. Some machines suspensions in the same category do not fall much further than just below level ride height and this is where Yamaha engineers wanted to get an advantage. Allowing the suspension to drop out more means the wheel attached to that suspension is theoretically in touch with the trail longer allowing for a more confidence-inspiring ride. The shocks on the 2016 Yamaha Wolverine R-Spec are fully adjustable and give each rider the tuning ability if you really need it. Our Wolverine was dialed in pretty good as far as general settings go but we were not jumping or racing down the trails either. For Wolverines intended usage I felt the shocks were spot on. The high back bolstered seats with three point harnesses keep you safely inside the cab and add to the comfort factor as well. 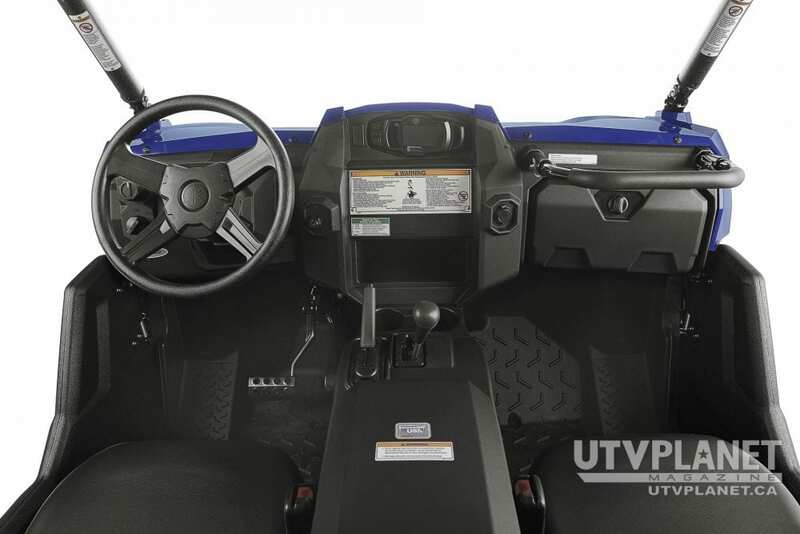 Slipping off into the cab of this new Wolverine R-Spec is really comfortable and feels like home. The high back bolstered seats with three point harnesses keep you safely inside the cab and add to the comfort factor as well. 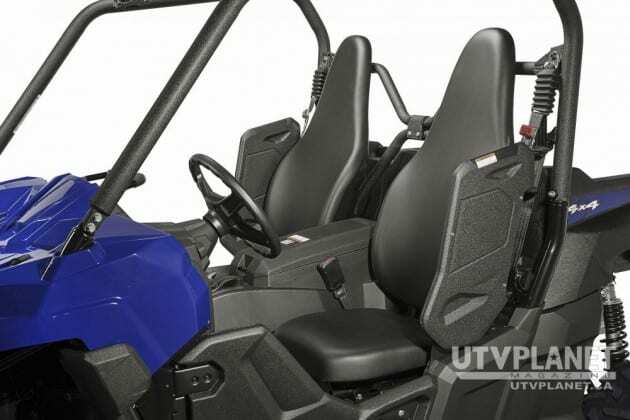 The multi-position gear selector uses a gate style arrangement and is very easy to move between gears. The operation was smooth and effortless no matter the position of the machine. In the floorboards there is ample foot space and as a bigger rider I never felt cramped in the vehicle. The floors have an embossed surface with plenty of grip when mud and water begin to rush in. 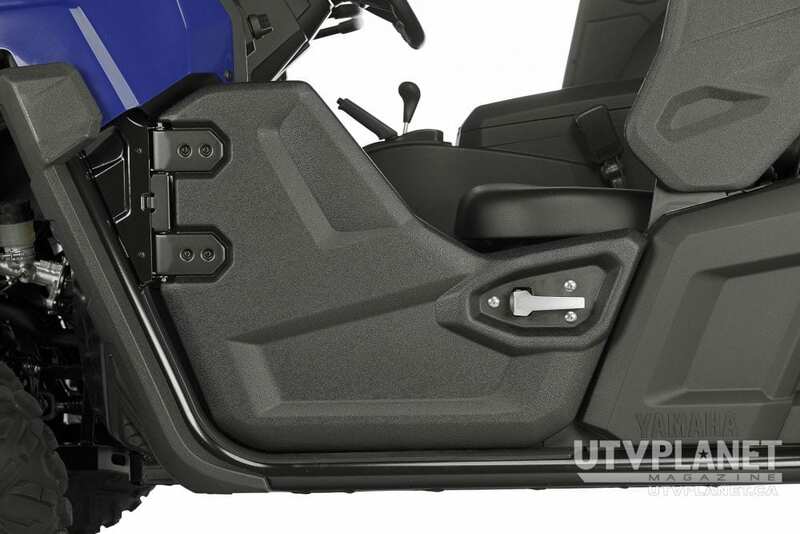 This is one of the better floors in today’s SXS offerings and it all goes back to inspiring confidence in the driver and passenger that we have heard so much of from Yamaha. 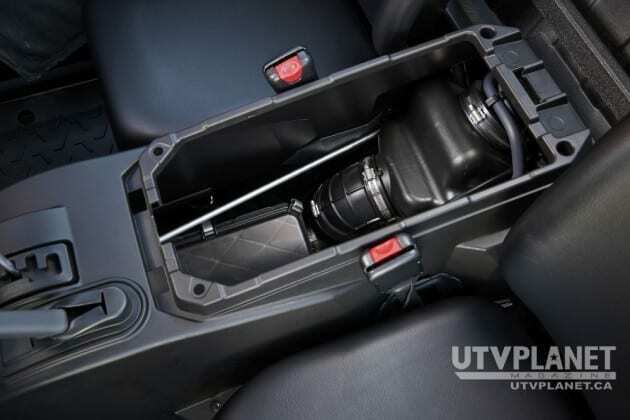 There is a genuine parking brake and this parking brake is a wet brake style, which is completely enclosed in the rear differential. The handle moves ever so slightly back when applied but holds the Wolverine like a vise. There is also an audible alarm for those who forget to disengage the PB lever. During our ride we were able to try the audible alarm and trust me when I say you will not ignore it. As you sit in the cab and just look around, you will notice Yamaha has engineered plenty of storage space inside the cab of the Wolverine R-Spec. For starters, a nice console storage area gives you space for drinks or snacks. Although this large area is not water-tight, it is in the middle of the Wolverine so if you do not sink the ride the contents will survive. The center of this storage box pulls out for quick and easy access to the air filter as well. The dash storage or glove box is also ample and a handy passenger cross bar gives your rider some peace of mind in the really bad sections of trail. This cross bar is adjustable for any arm length and padded for a good grip and a comfortable feel. Other storage is located in the center dash with twin drink holders as well as a small cubby for the inevitable cell phone that makes its way on the trip. The bed of the Wolverine has limited space but does have six steel tie down points for gear that you may want to drag along. The sides of the bed are tapered from front to rear to allow the Wolverine to smoothly negotiate tight off camber tree lines and not tear the bedsides off the machine. 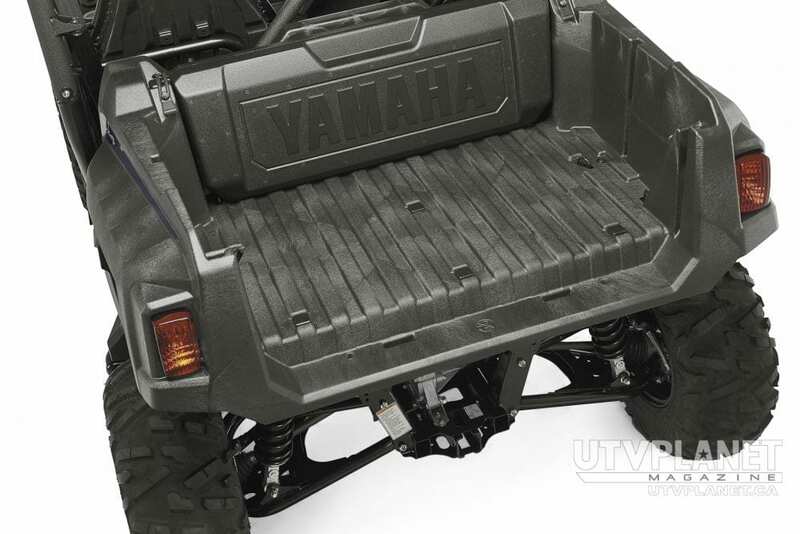 The bed does not dump but the tailgate is removable and Yamaha has many new accessories for the space back there. One such piece is the cargo box we had in our test unit. Yamaha makes no bones about their Power steering being a little firmer than the competition and this is so you can feel your way around the trail. 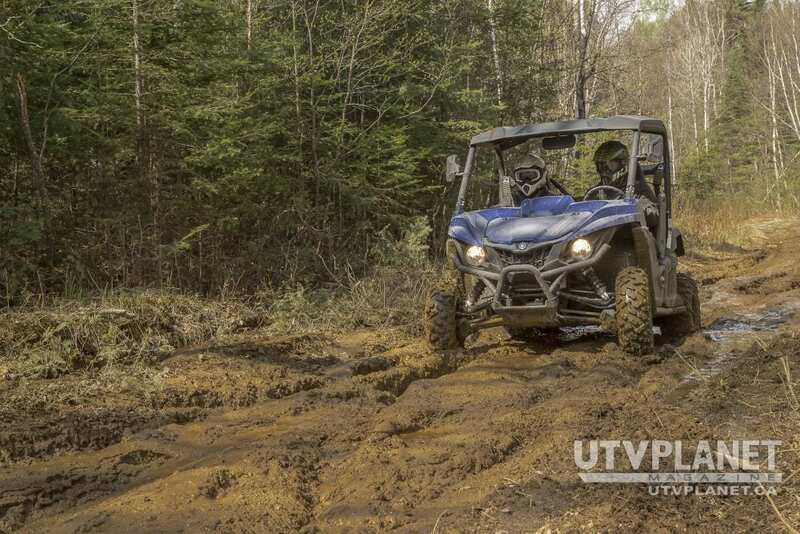 One item that is worth a notable mention is our Wolverine R-Spec did indeed include power steering and with the slow crawls up and around the rocky sections this was most appreciated. Yamaha makes no bones about their Power steering being a little firmer than the competition and this is so you can feel your way around the trail. When you get in the technical areas you will learn to appreciate it as well. We had a chance to cross two big swelling creeks and even though we did get water in the floors it seemed to clear out fairly well. A better drain system could help it get out even better, as once mud clods and small rocks were introduced to the floorboards the drain holes began to clog up. I did not find this to be a big problem but worth noting for sure. One other item that brought a little concern was the fact that where the molded floors met the dash sections, just under the dash, water could get in and onto your feet. A small seal of sorts could possibly eliminate this and I’m sure it will be addressed. The rocks and trees along the trail had little effect on the Wolverine and even those times when we cut the trail a little tight the “nerf” that is just in front of the rear wheels simply guided us past those obstacles. 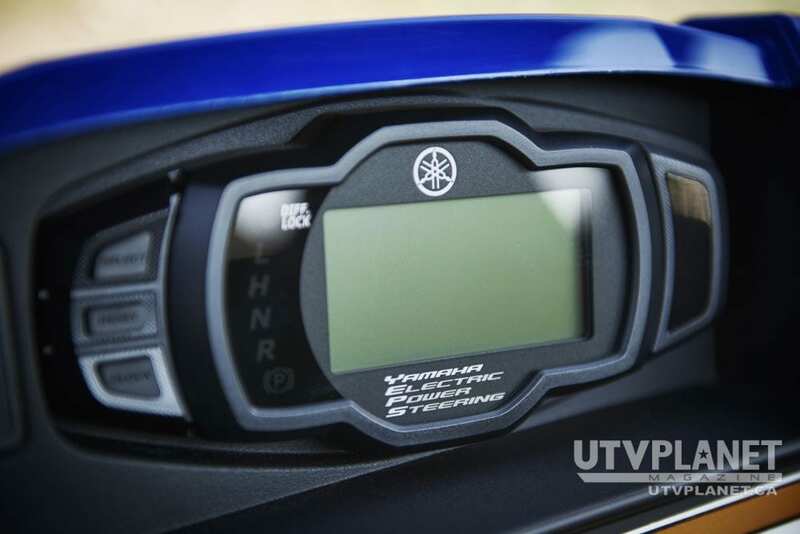 This small detail tells us that Yamaha thinks about any possible issues that could slow or stop your adventure. This is a true adventurer’s machine and is a testament to the army of Yamaha standing behind it. 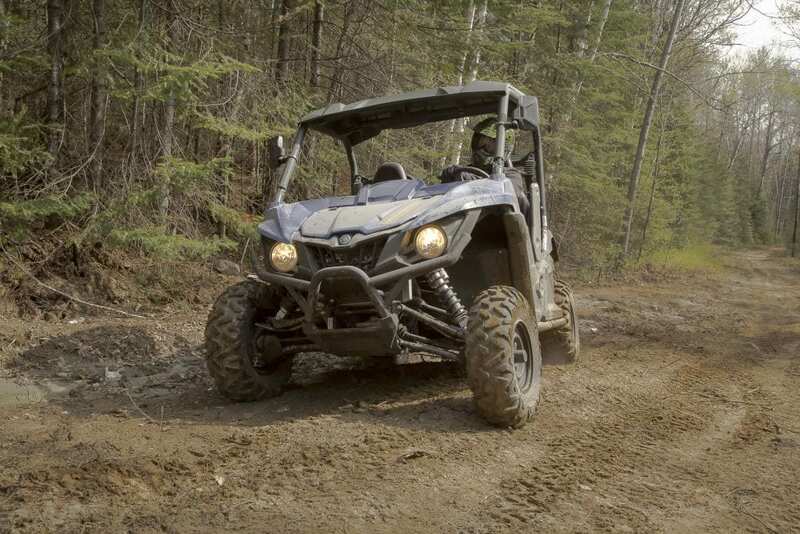 If you love the outdoors and want to explore the trails around you, this 2016 Yamaha Wolverine R-Spec is a great choice. We had no issues with our ride, and other than a little water getting in on us the Wolverine performed flawless. 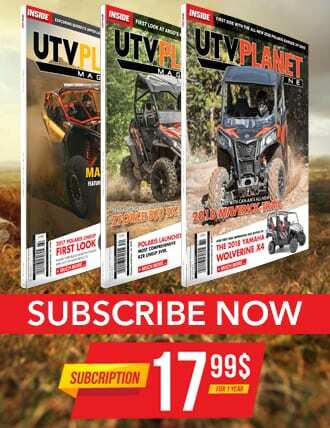 From climbing to crawling and even when we picked up the pace by dropping a heavy foot on the gas pedal the Wolverine R-Spec responded to our demands. 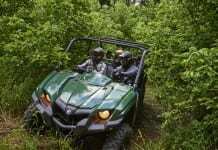 This is a true adventurer’s machine and is a testament to the army of Yamaha standing behind it.